The ice pilot for the 50-metre-long yacht, the Latitude, author of the ice pilot’s Bible, the 2010 Ice Navigation Manual, did manage to guide the vessel through this summer’s heavy ice-clogged waters to Cambridge Bay — for his 15th transit of the Northwest Passage. 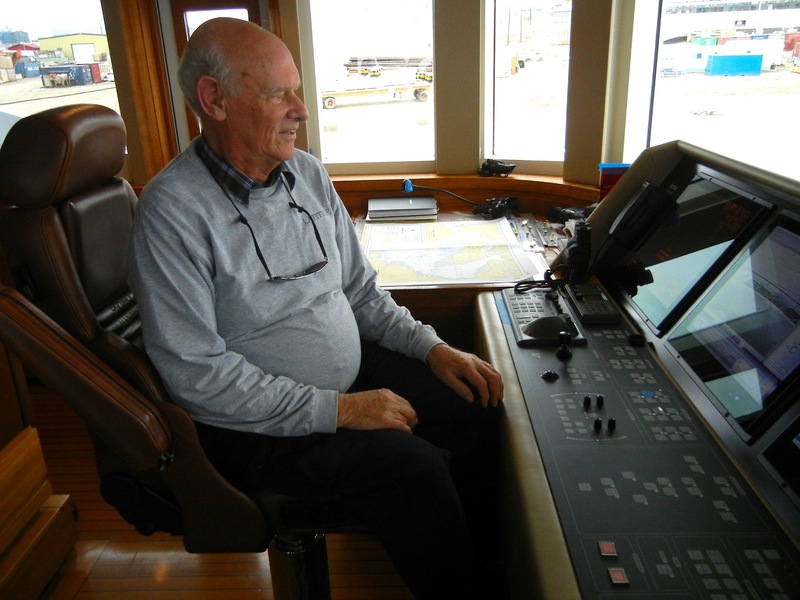 But veteran ice pilot Patrick Toomey didn’t have anything good to say about Canada’s Arctic maritime infrastructure efforts as he sat Sept. 13 on the bridge of the privately-owned yacht, docked near Cambridge Bay’s aging fuel tank farm and sealift marshalling area. The federal government could do “a hell of a lot more” about improving infrastructure in the Canadian Arctic, Toomey said during our talk. Toomey slammed what he called Arctic “grandstanding” by politicians such as Prime Minister Stephen Harper, who visited the north Baffin community of Pond Inlet with other federal officials this past August at the same time that the Latitude called there. “Then they go home and forget about it,” Toomey said of the Tories’ annual event in the Arctic. As of Sept. 13, the Latitude had been sitting in Cambridge Bay for four days waiting for the arrival of more fuel — which was finally transported to the tank farm via a pipe connected to a tanker sitting in the bay. Most ships transiting the Northwest Passage either don’t need to fuel up in Cambridge Bay or they require less fuel than the Latitude, Toomey said. 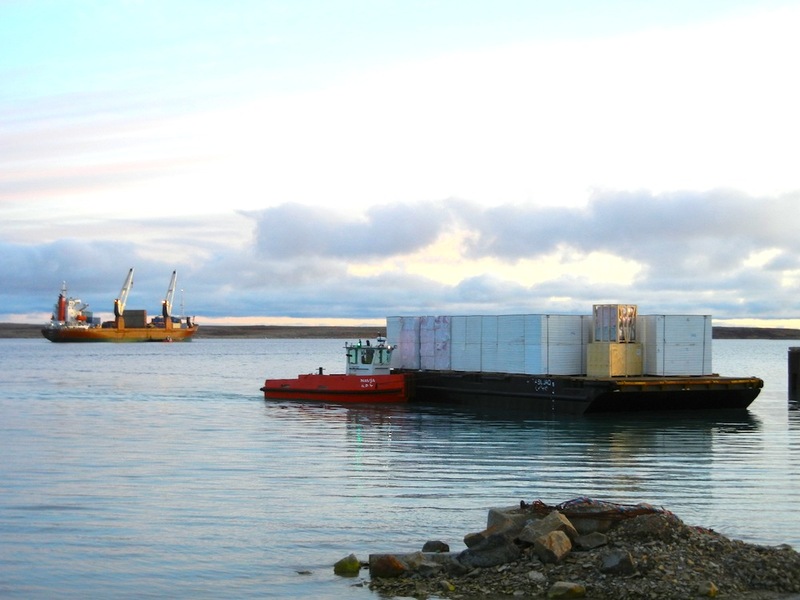 The Latitude is the first vessel of its size to arrange for a 40,000 litres of fuel in the western Nunavut hub, he said. Toomey was happy that his yacht would be refueled later that day. But he said it’s ridiculous that fuel and cargo is still delivered to Arctic communities the same way it was delivered in 1968. That’s when Toomey, now 80, first began sailing around the Arctic. During his long career, he served as captain on nine Canadian icebreakers and six Russian ones, and retired from the Canadian Coast Guard 23 years ago. He retired because he said he was frustrated with the federal government’s decision to cancel the Polar 8 icebreaker project in 1990. And Canada still doesn’t invest in enough icebreakers, refueling points, charts, docks or ports of refuge in the Arctic, he said. Toomey, who rattled off an impressive number of trips through the Northwest Passage and the Northern Sea Route, has also logged 33 trips to Antarctica, where a body of water was named “Toomey Strait” after him. Over the past two years, he visited Cambridge Bay while serving as an ice pilot on the Michaela Rose and on the World, a mega-yacht. In 2016, Toomey will make a return voyage through the Northwest Passage, with the 13-deck 69,000-tonne Crystal Serenity and its 1,070 passengers and 665-member crew. Toomey is already working with Crystal Cruises to prepare for that voyage. But any vessel in the Northwest Passage should be staffed by a skilled ice pilot, Toomey said. 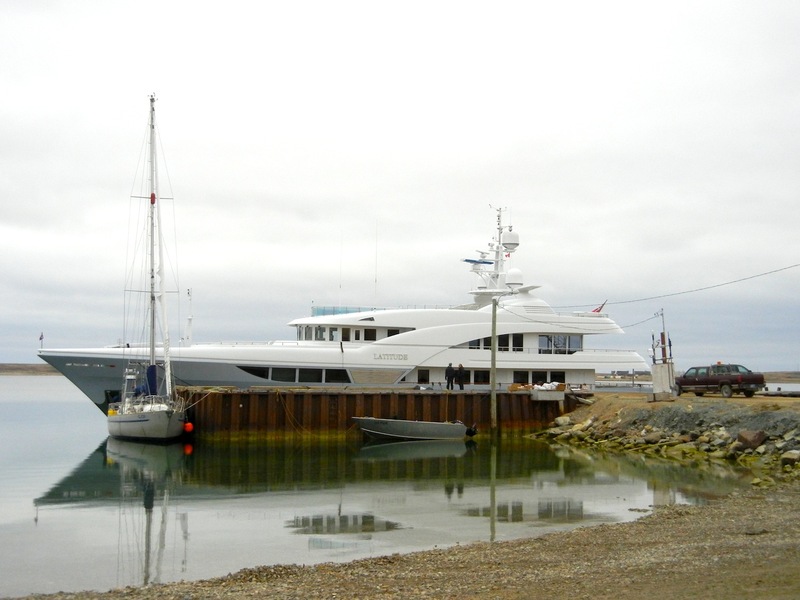 The Latitude at the dock in Cambridge Bay. (PHOTO BY JANE GEORGE)said. And he said there should be a way to keep the Northwest Passage free of poorly equipped vessels or reckless adventurers, like group of Americans who tried to travel through the passage on jet skis for a reality television show and then required a rescue. Either that, or lay charges against such people when they require help from an icebreaker, Toomey said. As well, he’d like to see the International Marine Organization’s Polar Code adopted. This code for ships operating in polar waters would cover design, construction, equipment, training, search and rescue, and environmental protection matters “relevant to ships operating in the inhospitable waters surrounding the two poles,” the IMO says. And the Polar Code would come into effect in 2016 — four years after the original target delivery date — to replace voluntary regulations in place since 2002. The code would supplement existing mandatory regulations in place in the Arctic and Antarctic, and apply to a wide variety of ships, including sealift vessels and cruise ships. Russia is far ahead of Canada already in training ice navigators and developing infrastructure, Toomey said. As for the Northwest Passage, this waterway will be used more often, he said, because it’s simply the shortest way to get from Europe to North America. Toomey said ice conditions still vary greatly from year to year. This past August, Toomey guided the Latitude, which does not have an ice-class hull, through “bad ice,” and, at one point, the Coast Guard icebreaker, Pierre Radisson, piloted by one of his former students, helped guide the Latitude through dense fog. As the yacht sailed slowly, at one to three knots, its eight passengers, which included Singaporean business magnate Anil Thadani, the owner of the Latitude, saw 18 polar bears, including many females with cubs. 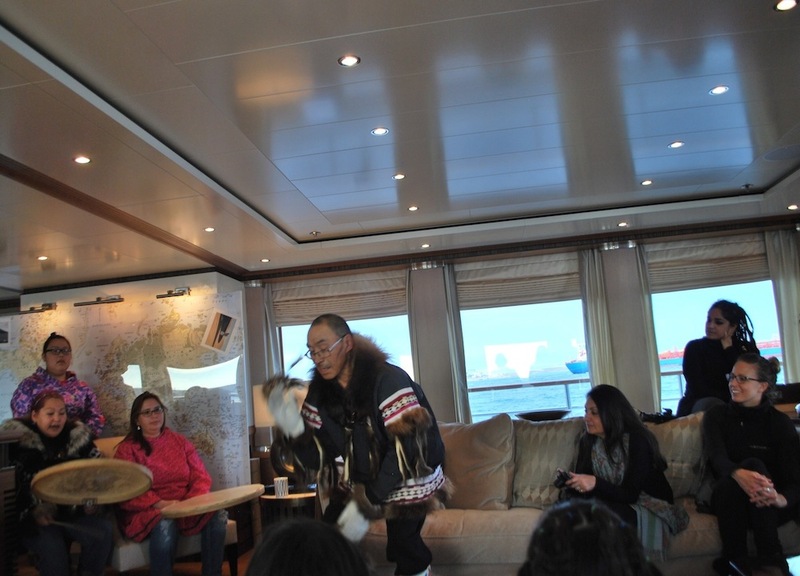 Thadani and his guests were keen on photographing wildlife, but while in Cambridge Bay, they toured around the town also and hired local drummers and dancers to perform for them. The Latitude departed Cambridge Bay for Nome, Alaska late Sept. 13 and plans to end its leisurely Arctic cruise sometime in October in Seattle, before heading to the South Pacific. Look for more posts from Cambridge Bay, Nunavut.